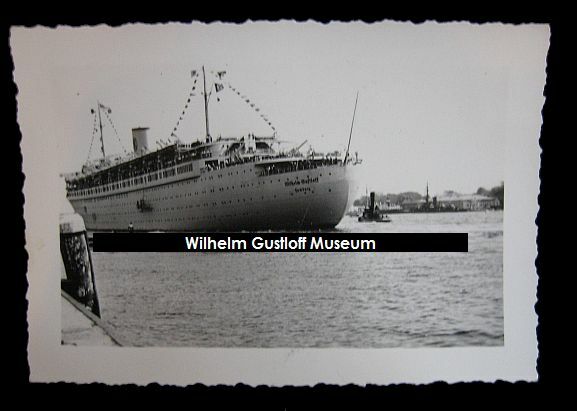 On July 17th, 1939, The Wilhelm Gustloff left for the last special voyage of her career. With over 1,000 of the best German athletes on board, she set sail for Stockholm, Sweden for the 9 day Lingiad sporting event. The idea about the non-competitive sporting event came from the International Gymnastics festival, Lingiad, which involved 7,399 participants from 12 nations. 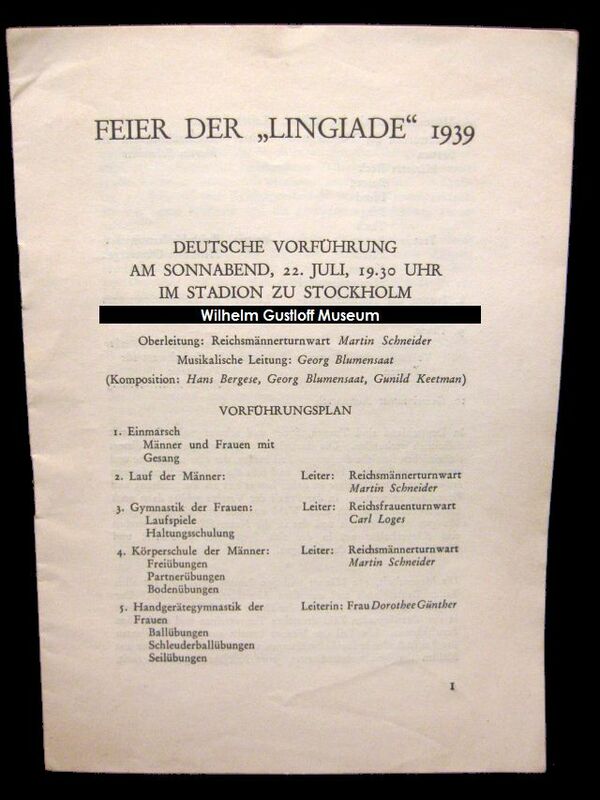 This was organised in Stockholm in 1939 to mark the centenary of the death of the "Father of Swedish gymnastics" Pehr-Henrik Ling. Amusingly, he is better known in modern times as the inventor of the Swedish massage). 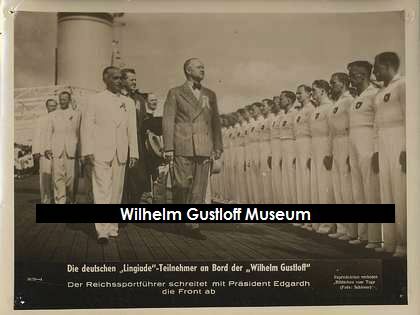 Due to the German rules of not berthing their liners in allied countries, the Wilhelm Gustloff anchored off-shore and several boats were used to ferry athletes to and from the gleaming white dormitory. 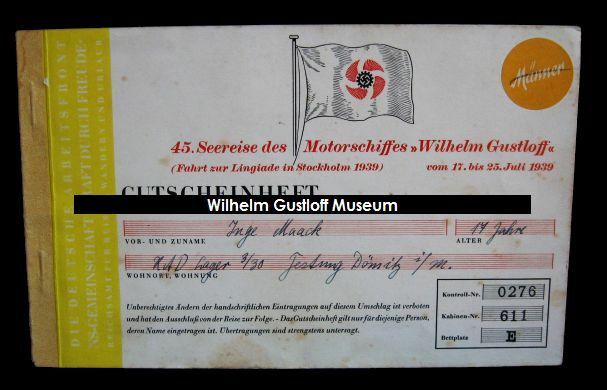 The event eventually ended and the Gustloff took her passengers back to Germany. This was her 45th voyage and she would only complete 4 more before the end of her pleasure cruising career. Name: Hard to see - possible Wilhelm? 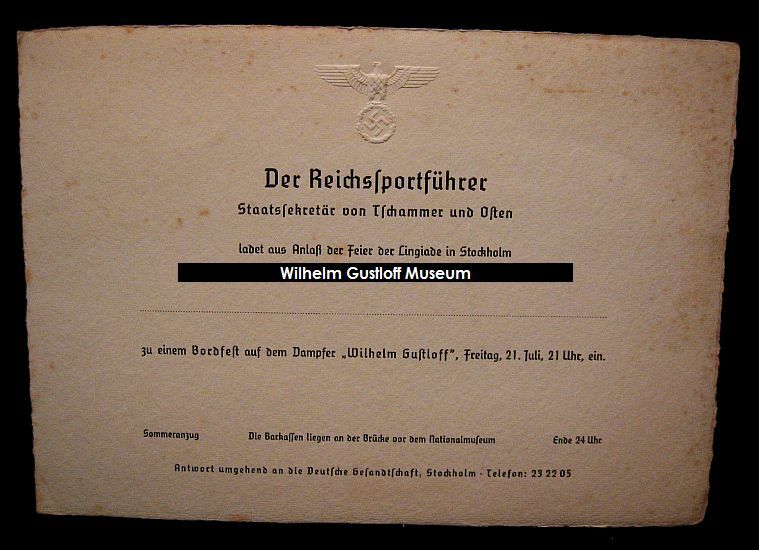 Address: Adolf Hitler Str. 121. 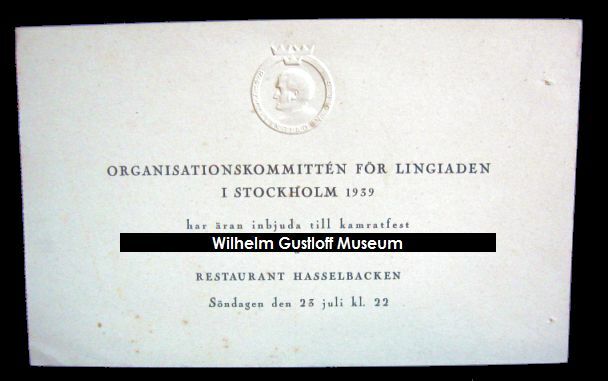 Lingiade, Stockholm Party Invitation on board the Wilhelm Gustloff. On Saturday, 22 July at 19.30. Men and women with singing. 3rd: Women's gymnastics: running games, posture training. Head: Reichsfrauenturnwart: Carl Loges. 4th: School body of men: calisthenics, partner exercises, floor exercises. Head: Reichsmännerturnwart: Martin Schneider. 5th: Handset gymnastics for women. Ball exercises, spinning ball exercises, rope routine. Director: Mrs. Dorothee Gunther. 7th: Gymnastics of the men and women. Head: Reichsmännerturnwart. Martin Schneider. Men: high bar, parallel bars, horse, rings, table. Women: bars, horse, box, obstacle relay. Director: Reichskinderturnwart Hermann Ohnesorge. 9th: Dances. Girl dance: Head: Mrs. Dorothee Gunther. Folk dance of the men and women. 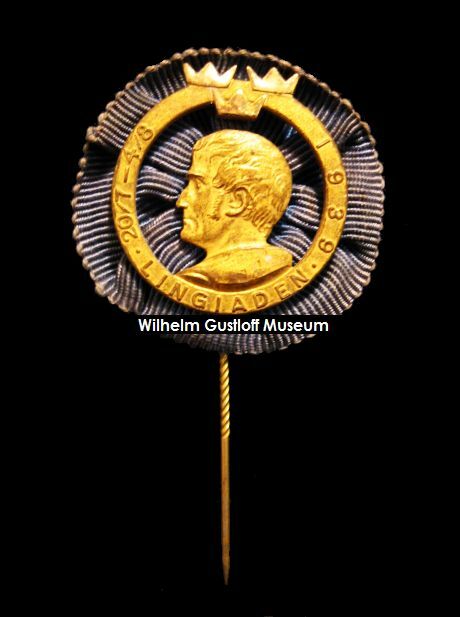 Head: Reichsfachward for folk dance: Alfred Müller-Hennig. In Germany, sports and gymnastics are combined to be uniformly upbeat. The German show takes out this uniform part which aims at a general and basic training, and takes the individual forms of sport into account. We strive for a body of culture, to penetrate into the sport with gymnastics and gymnastics are sports. 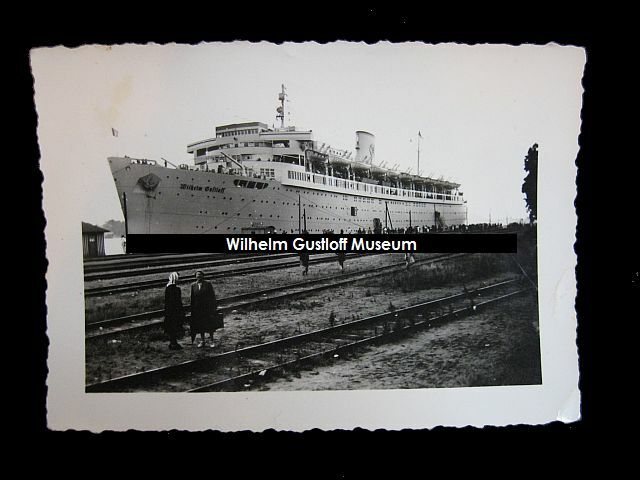 Three images of the Wilhelm Gustloff in Swinemünde: July 25th, 1939 for Lingiad. Each one backmarked the same (at right). Return date from this voyage. I was fortunate enough to meet Ingrid online and talk to her about youth. Hailing from Berlin, Ingrid was only 4 1/2 years old when her mother took her onboard the Wilhelm Gustloff in July of 1939. Their destination was the Lingiaid in Stockholm. She told me she had many fond memories of being on the trip and was kind enough to share photographs of herself at the time, as well as newspaper articles and other copies. "Before starting this journey I already had to do a lot of gymnastics for little children at the "Reichssportfeld" in Berlin. Teacher was the well-known "Onkel Ohnesorge". Being 4 1/2 years old I started this trip with my mother and other families. We had a cabin on Deck Nr.3 . I specially remember the big swimming pool on the ship, where I got very frightend because of the deepness, although my mother kept me tight. I remember too,that there must have been a little shop where I got bought a little cosy icebear. 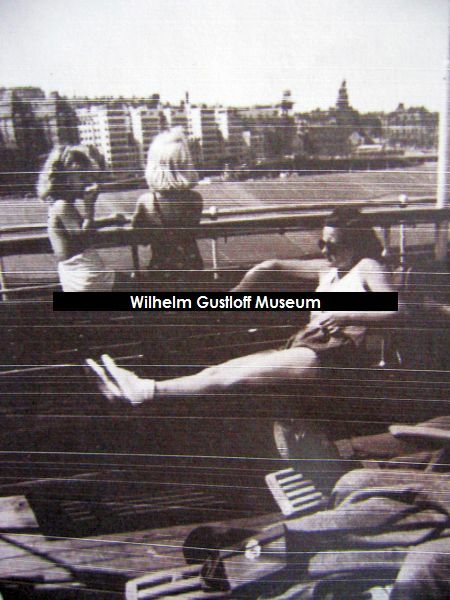 Beside of many activities with children-gymnastics on the "Wilhelm Gustloff". I remember very well, when I was taken down on the "fallreep" to the boat, which brought us to the pier of Stockholm. We children had to do gymnastics during the Lingiade event in front of King Gustav Adolf and his family. For me as a little girl everything was very exciting." Included below are three postcards of Stockholm her mother purchased on the trip and are now in our collection. I thank Ingrid for sharing these memories with me and helping to add to the memory of this liner, especially for a trip which very little is available elsewhere. 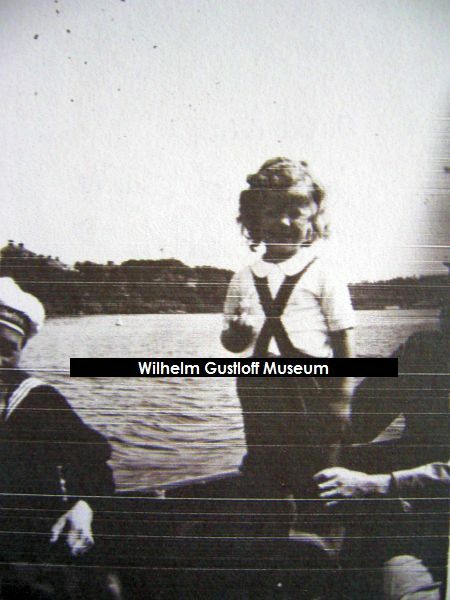 - This photograph shows Ingrid being ferried from the Wilhelm Gustloff to Stockholm - July 1939. Ingrid and other passengers on the deck of the Wilhelm Gustloff. 1: Three postcards of Stockholm, Sweden purchased during the Lingiaid trip - July 1939. 2: Article: "...rldens ungdom i givakt för Ling." or "World Youth on Parade for Ling." 3: Article: "Tysklands flytande Lingiad-hotell på Strömmen" or "Germany Lingiad floating hotel on the river current." 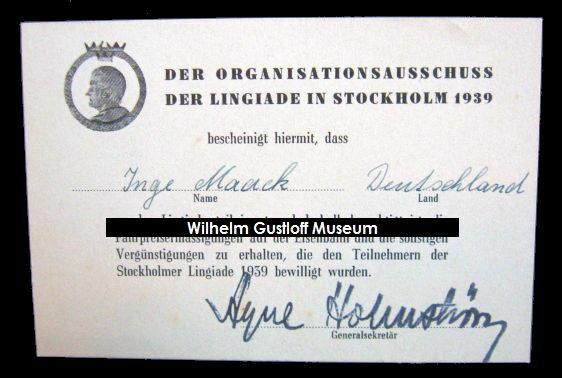 4: Article: "Med det tyska Kraft Durch Freude fartyget "Wilhelm Gustloff" kommo 1.100 tyska gymnaster till Stockholm och Lingiaden." 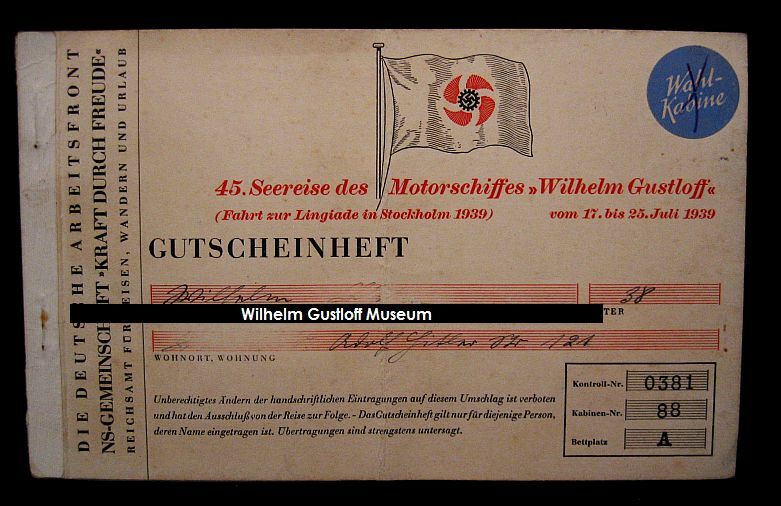 or "With the German Kraft Durch Freude ship "Wilhelm Gustloff" 1,100 German gymnasts came to Stockholm and Lingiaden. Commemoration book on the Lingiade Event in Stockholm. 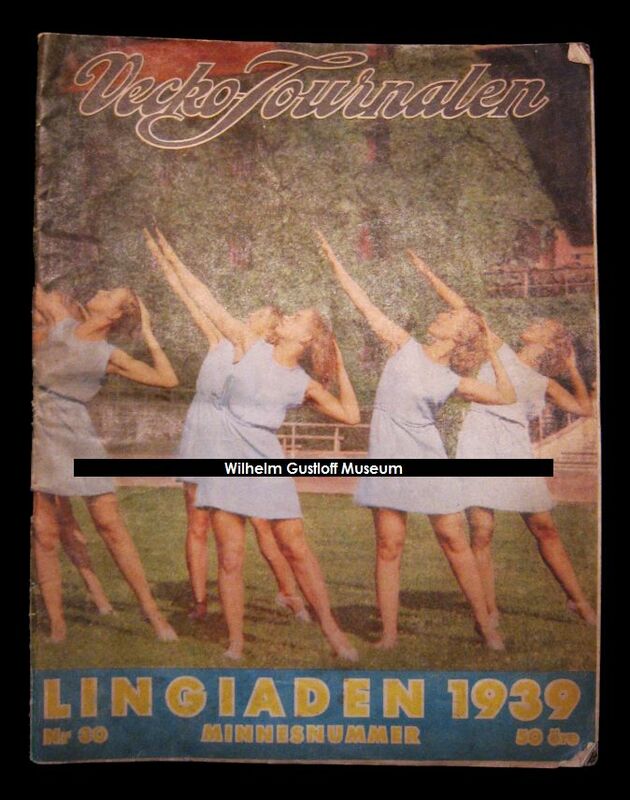 Lingiaden Gymnastics Association's Yearbook - 1939. 340 pages in Swedish and English - featuring all the countries that participated in the Lingiad. Pages 341 to 434 are advertisements and sponsors. Address: RAD Lager 3/30, Testung Dömitz i /M. Dates Below: Monday: July 15th, 1939 - Tuesday: July 16th, 1939 - Wednesday: July 17th, 1939 - Thursday: July 18th, 1939 - Friday: July 19th, 1939 - Saturday: July 20th, 1939 - Sunday: July 21st, 1939 - Monday: July 22nd, 1939 - Tuesday: July 23rd, 1939 - Wednesday: July 24th, 1939 - Thursday: July 25th, 1939. 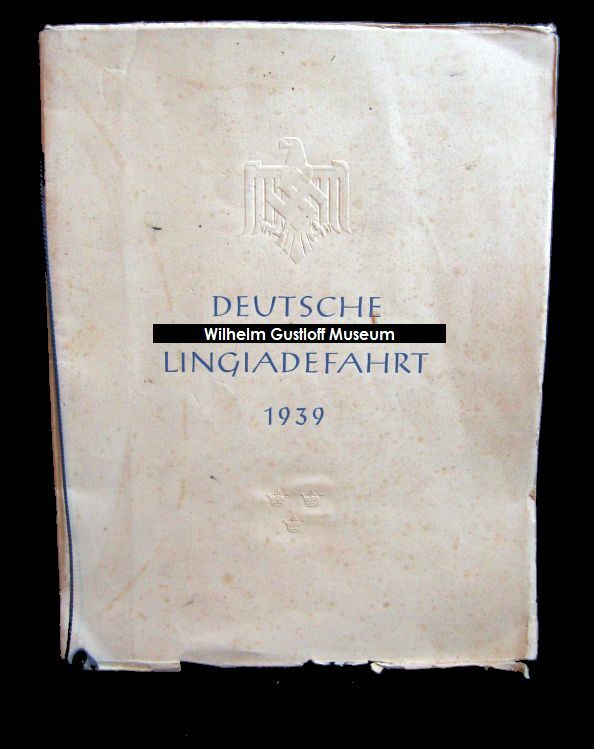 Under the Speisekarten - Menus page, it is noted that the Gustloff used 15 variations of menu covers for her trips. This is one of two exceptions throughout her 50 voyages to which three different covers were known to be used. During her Lingiade trip, the three new covers at right appeared on board. The first is Riga - the capital and largest city of Latvia. The second is a cover featuring the Crane Gate from Gdansk. The third features the city of Königsberg and Königsberg Castle - where the famous Amber Room is generally believed to have been stored and destroyed. "Excerpt from the price list for drinks. 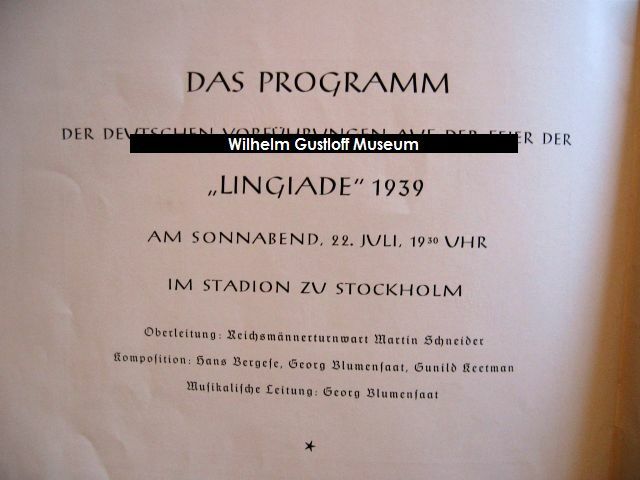 Sunday, July 23 at 22.
at the Lingiade participates, and is therefore entitled to receive fare discounts on the railways and other benefits to the participants of the Stockholm Lingiade 1939 were approved. The link to additional photos can be found at the bottom of the page. Magazine with several articles of the Lingiad in Stockholm and a two page spread about training onboard the Gustloff. 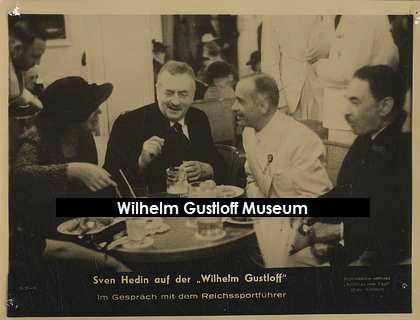 Right: Sven Hedin sitting down with the Reichsjugendführer Baldur von Schirach. 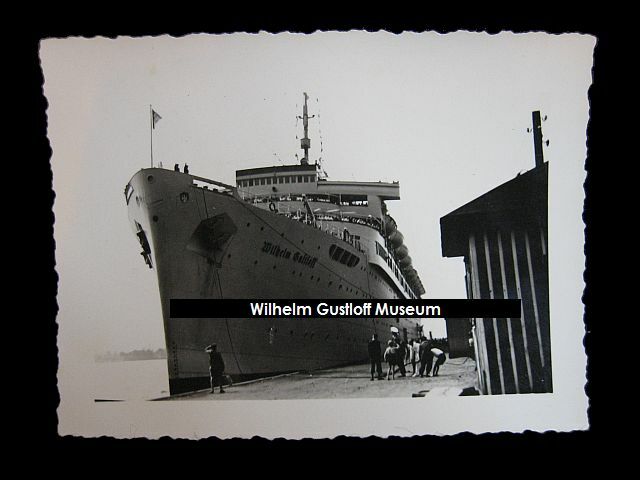 Three photo postcards from the Wilhelm Gustloff's Lingiad voyage. Grouping of 20 Lingiade photographs and newspaper article from Swedish Daily Newspaper. 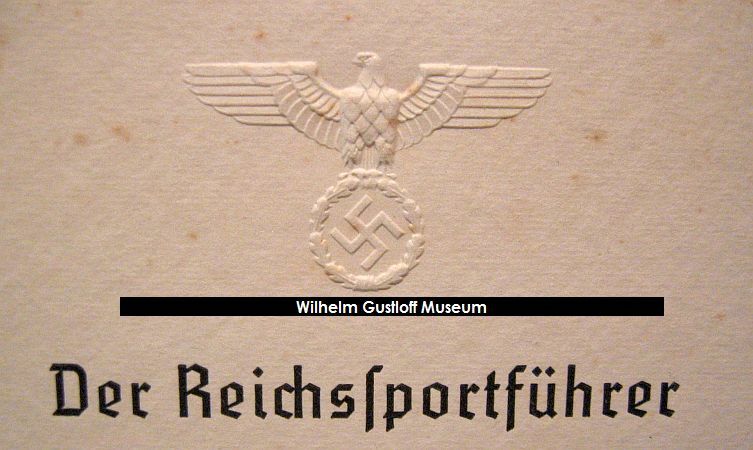 Featuring several photographs of the group's time on board the Wilhelm Gustloff in Stockholm. "Så här ska vi göra," säger den tyska barntruppers ledare, som bär namnet Ohnesorgen. Gruppens yngsta deltagare fyller snart tre år och de äldsta äro fem.